Muscari armeniacum (Grape Hyacinth) x 50 - the last of the trio to flower in April and May, little cones of deeper blue, sometimes tipped paler. We have put together the perfect colour combination of soft cool blues, to give you a bright display in early and main spring - 10 weeks of colour every year. 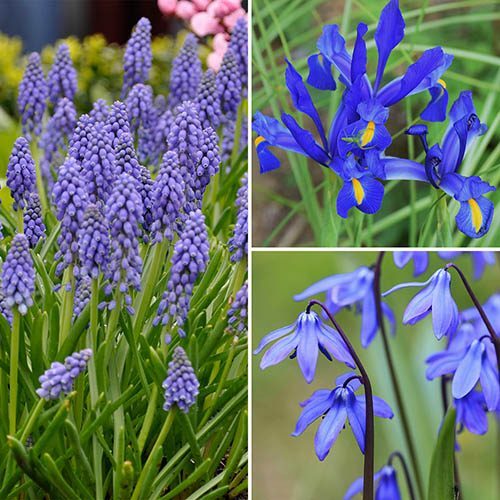 Perfect planted mixed in either large pots, or a group in the garden, you will get a succession of cool blues from mid February into May, with this well chosen selection - which also do really well in shade too and will slowly natualrise over many many years. Planting Instructions Depth x spacing on each packet. Note - these 3 packates are all joined together in one strip, but there are 3 'pouches' for the 3 varieties.